Snake tattoos can either create positive feelings or cause negative emotions like fear. People who decide to get a snake tattoo usually have a profound relationship with nature. They also have a deep understanding of snake’s symbolical meaning. Snake tattoos are very eye-catching and are suitable for both men and women. 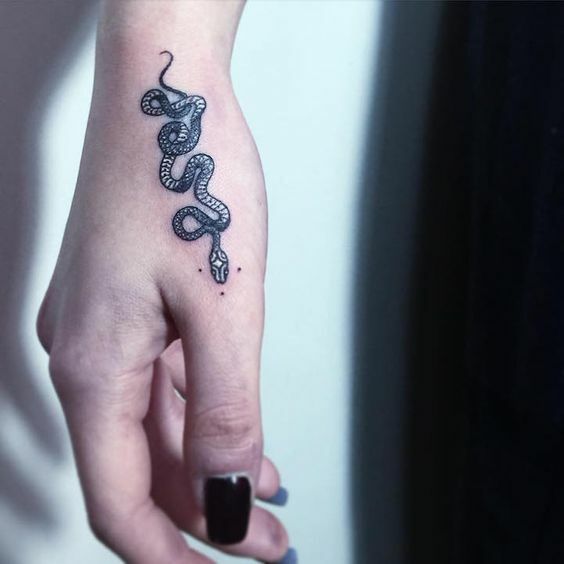 Small snake tattoo on the hand. The symbol of the snake appears in many cultures and regions. There are hundreds of tales and legends about this fascinating creature. The meaning of snake tattoos can vary depending on what reference you will choose. If you’re thinking of getting a snake tattoo – check out these photos, we are sure you will find some inspiration. 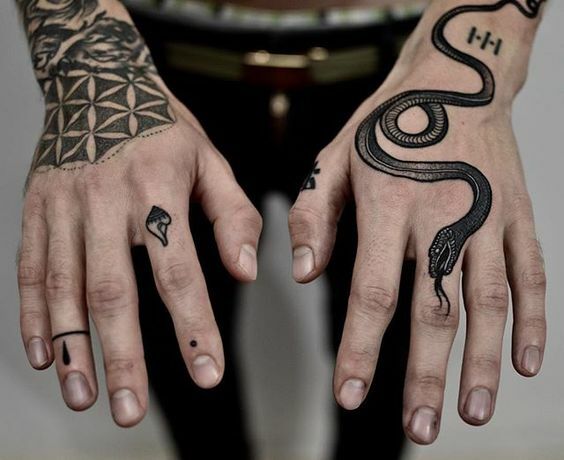 White snake tattoo on the right hand. What do the snake tattoos mean? 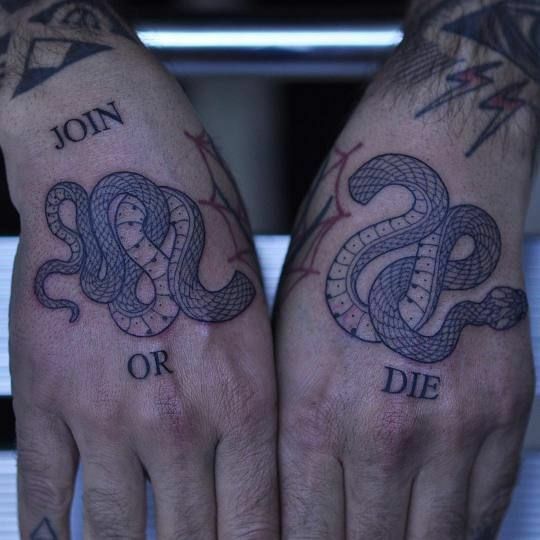 Vipers, Cobras or any other snakes can be an incredible tattoo design. Although, for some people the image of the snake associates with scary things. This frightening image of the snake came from Judaism and Christianity. The snake in these religions is symbolizing the forces of primal evil. However, there are many other meanings of the snake, and it appears in numerous religions and cultures. Black snake tattoo on the hand. Snake surrounds the mandala on this excellent piece on inner arm. Red snake tattoo on the right rib cage. As we’ve mentioned before, the meaning of the snake symbol varies depending on the cultures. You can find the snake in almost every part of the world. Since the ancient times, the serpent represented fertility and a creative life force. Also, when the snake shed its skin, it becomes a symbol of rebirth, healing, and immortality. A snake in a circle with its tale in the mouth (ouroboros) symbolizes eternity of life. Snake can also be a symbol of healing and rebirth, sexual energy and fertility. Other symbolical meanings are revenge, transformation, eternity and continual renewal of life. Blackwork snake tattoo in the heart. Kingsnake tattoo on the inner arm. Snake tattoo over the leg and the foot. In Native American tribes, the snake was a symbol of the men. Also, almost every tribe used the snake symbol for various rituals to call the divine powers. 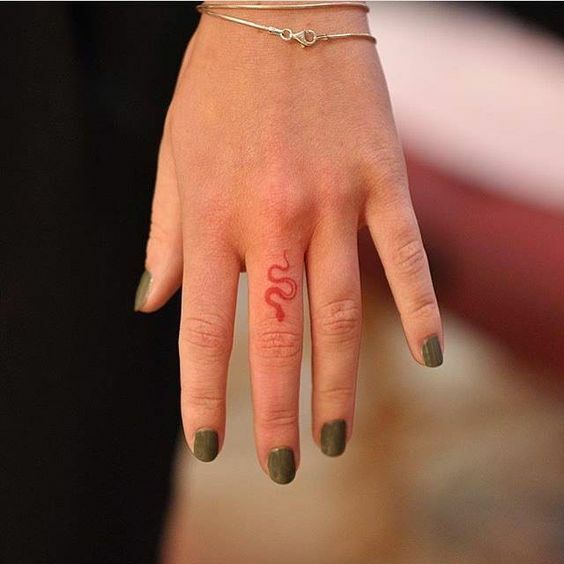 Tiny red snake tattoo on the finger. Small snake tattoo on the middle finger. Old school snake and dagger tattoo. Black snake tattoo on the leg. For ancient Celts and some other cultures, the snake was a symbol of a close relationship with nature. This image comes from a snake’s unique behavior. Regardless of the region, snakes disappear in the colder months and reappear when the sun is getting warmer. Rose and snake tattoo on the calf. Small snake tattoo on the chest. In Hindu mythology, the snake Shesha is one of the first creatures in the world. And it is also responsible for holding and carrying the planets in the universe. Also, in many pagan religions, the snake is a symbol of rebirth and healing. This image of the healing came from snake’s periodic skin changes. Due to the elongated shape of the snake, snake tattoos look best on arms, sleeves, and thighs. You can also get a smaller design on other body parts such as hands, wrists or neck. For larger pieces, you should use the space on your back or your chest. Snakes are beautiful creatures, and we should not be afraid of them. We must always remember that every living creature in our world is vital. Knowing the fact that lots of animals extinct, we must do everything to preserve the ones we still have around us. Snake tattoo is a perfect way always to remember that we’re not alone on this planet. And we have to protect it. Take a look at the rest of our snake tattoo gallery. Also, you should remember that tattoo is going to stay with you for the rest of the life. So you must choose wisely and discuss the design with your tattoo artist. Blackwork snake tattoo on the arm by Sang Bleuzurich. Cover up snake tattoo on the wrist. Intertwined black and white snake tattoo. Intertwined red snake tattoo on the inner arm. Large snake tattoo on the forearm. 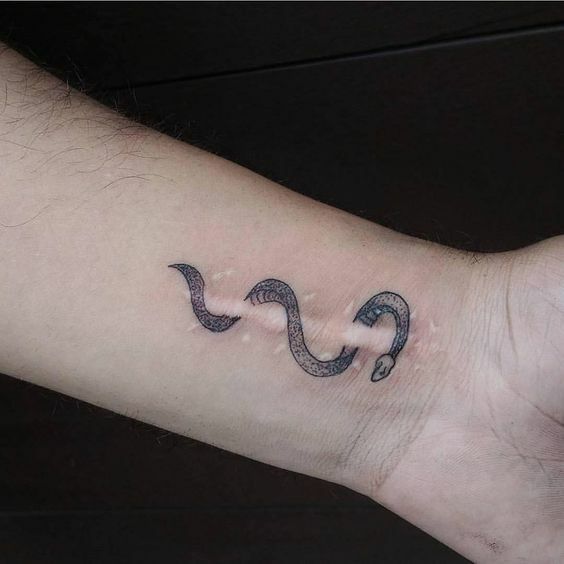 Small snake tattoo around the wrist. Snake tattoo around the elbow. Another snake tattoo on the back. Snake tattoo on the inner arm. Stick and poke snake tattoo on the wrist. Teal and black color intertwined snake tattoo. Traditional snake tattoo on the arm. Traditional snake tattoo on the wrist. White snake tattoo over the wrist and the hand.